Over the years we have had the privilege of performing with some very talented jazz musicans and vocalists around St. Louis. Unfortunately St. Louis offers few venues for live Jazz. In order to have a place to perform live with other jazz players we started our Jazz Pro Jam Series of concerts at a local club (Cookies Jazz & More - now Robbies) and have been hosting similar events now for nearly 10 years. We have a huge library of photos, audio and video that we thought should be shared with other musicians and their fans. 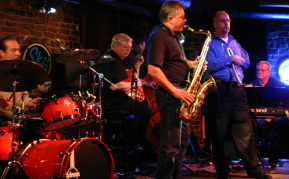 For club owners we offer some of the best live jazz around town. The group normally includes a core rhythm section of four or more players and we have had 10 or more singers/musicians on stage at one time on many occasions. These monthly events attract a strong following for the venues that support them.